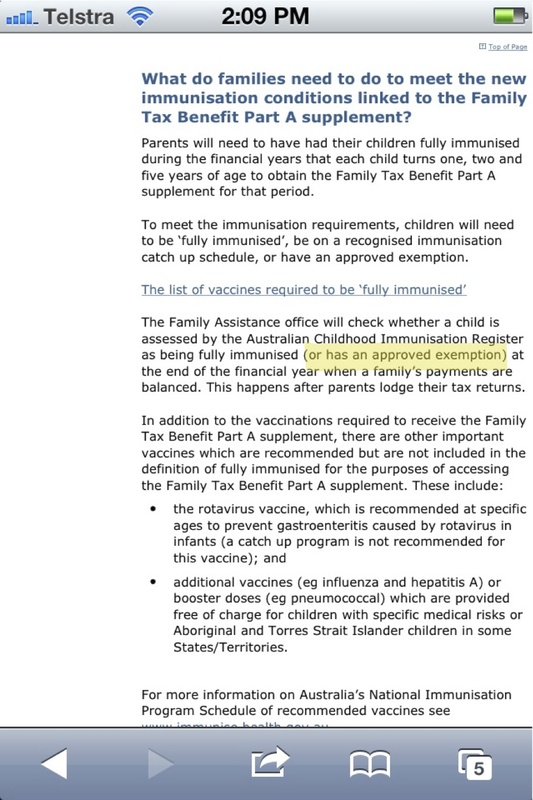 Today's blog post is just a quick FYI for parents who receive Family Tax Benefit A and are not having their children vaccinated. As you probably already know, the supplement which used to be eligible for all recipients of Family Tax Benefit A is now being included in an immunisation incentive scheme. That means you, the parent, have to ensure that your child is either fully vaccinated according to the schedule, or that you have lodged a conscientious objector form. What I want to make sure non-vaccinators know is that your Conscientious Objector form has an EXPIRY DATE. Please don't assume that because you lodged it yonks ago, you're covered. I rang the Family Assistance Office today to double check my children's status and discovered that Lukas' had lapsed some time ago, Brynjar's will lapse on his next (7th) birthday, and Ari's will lapse on his seventh birthday in 2015, as well. So, anyway, double check your status if you are expecting the supplement bonus and haven't fully vaccinated your child, make sure your Conscientious Objector Form hasn't expired. Please circulate this information to anyone you believe it might be relevant to.